When an individual body can't stop excreting waste products it's called diarrhea; it's recognized as an illness and attempts are made to cure it with medicine or diet. Unfortunately, the same is not true of a nation's economic body. For example, the American food chain, from the farmer to the grocery store to the refrigerator, wastes 40 percent of all food produced, according to a 2012 study by the Natural Resources Defense Council (NRDC). The percentage of waste is undoubtedly higher when it comes to inedible products. Is it unreasonable to think that 50 to 60 percent of the inedible products made in, or imported into, the U.S.A. are not consumed and end up as waste of one form or another? Just look into the stores and estimate how much of what you see will be sold. Who knows? Maybe 90% of all the crap for sale in this country is waste. Exhibit A is a glass juicer which performs its function flawlessly and costs little. Inexpensive variations of this design are also available in plastic. 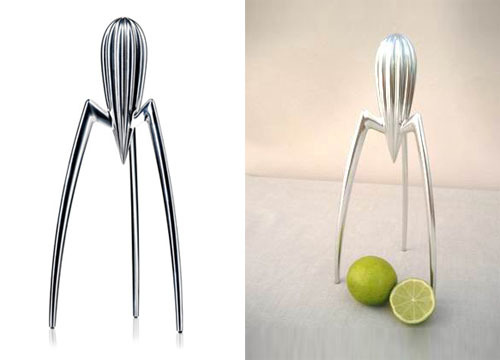 Exhibit B is an "iconic" juicer by Phillip Starck. It's functionally defective but it sells as a "design object" for the ridiculous price of $100. These two exhibits suggest a way to begin curing the design diarrhea which afflicts our civilization. Let's start by getting rid of all designs which resemble Exhibit B, i.e. design objects which do not offer any advance over existing designs. In the next blog, I will begin discussing how to distinguish between designs which are worthy products and designs which are wastes of time and money.